I am a military spouse and my family has been stationed in the Hampton Roads area for 7 years. Hampton Roads consists of 7 cities including Norfolk, Virginia Beach, Chesapeake, Portsmouth, Suffolk, Hampton, and Newport News. This area is very difficult to move to because there are a lot of bases with limited base housing which causes many military families of all ranks to live off base. It's also difficult because there are so many different areas to live and a tunnel system that can cause long commutes. I hope this PCS Guide to Norfolk Virginia Beach Area is helpful! There is a lot of information in this PCS Guide so I recommend you download the guide with maps, save it, and print it out to begin your research. Hampton Roads is home of the largest Navy Base and has over 16 bases surrounding the area. Below is a list of the Hampton Roads Military Bases along with a map. If you are PCSing to the area, it’s very important to research the area ahead of time and figure out the best place to live. Things to take into consideration are commute time, tunnel system, type of home or neighborhood, school system, and proximity to the beach or bay. What is Hampton Roads, VA? Second, this area is called Hampton Roads, Virginia and it consists of 7 cities: Norfolk, Virginia Beach, Chesapeake, Portsmouth, Suffolk, Hampton, and Newport News. The area is broken into 2 sections called North Hampton Roads and South Hampton Roads. Additional cities located in North Hampton Roads (on the Peninsula) are Yorktown and Williamsburg. 1. 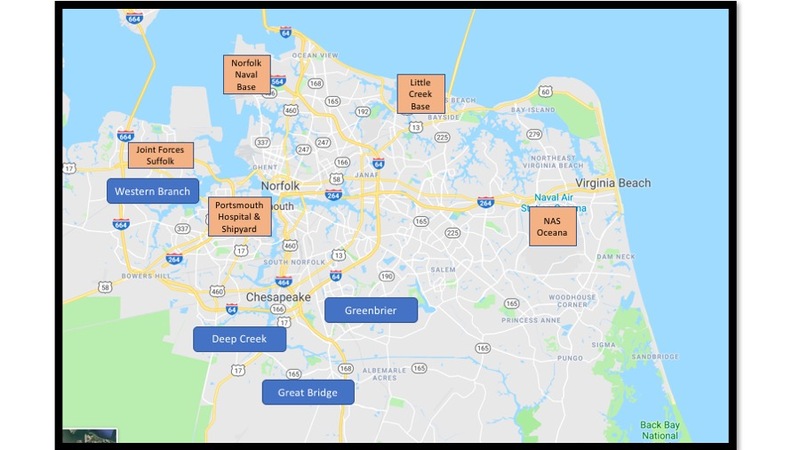 No matter where you chose to live in Hampton Roads, make sure you think about how the tunnel systems will affect your commute. 2. Housing prices are very expensive in this area. The further you live out of town, the more square footage you will have for a better price, however your spouse will have a longer commute. 3. Remember a lot of the areas close to the water are expensive and price per square footage is typical for a resort town. 4. Don’t judge a book by its cover! Some of the older less updated homes are expensive for a reason, they are located in a great area or a great school district. 5. Take note of where the highways are located and how it will affect your commute. 6. Military housing is limited in the area, so find out where other military families live so you can be close to other families who can support you during your time here. 7. Tricare Prime vs Standard – There are a lot of treatment facilities in the area, however there are a lot of active, retired, reservists and their dependents in the area so wait time may be long. Many doctors’ offices in the area do not take Tricare Prime due to poor reimbursement rates, but a majority will take Tricare Standard. The decision is yours, however if you have kids or you are pregnant you may want to consider getting Standard so you can choose a doctor in the community to treat you and your family. 9. Whether you are looking to buy or rent, use a realtor to help you navigate the area. Be prepared to make sacrifices when choosing a home. Check out our directory of military friendly REALTORs. The city of Norfolk is made up of a diverse population. There are pockets of really nice neighborhoods, along with pockets of not so safe areas. Norfolk is known for its old historic colonial style homes. Norfolk definitely has a different look than Virginia Beach, Chesapeake and other areas. It has a lot of charm. Norfolk also has a bustling downtown area with skyscrapers, MacArthur shopping mall, and lots of restaurants. Granby Street is the main street in downtown Norfolk that has shops, restaurants, and bars. During the day, it’s a great place to shop at MacArthur Mall then grab a bite to eat on Granby Street. At night, Granby Street transforms into a great place for nightlife where you can bar hop from hip martini bars to cozy sports lounges. Another popular area in Norfolk is Colley Avenue and 21street. Old Dominion University is just North of this area which has a mix between young college students and families who live nearby. Langley AFB/Ft Eustis – Must use a tunnel. Read about the tunnel systems and traffic patterns. Norfolk Public Schools: Norfolk Public School system is good, but it seems the elementary schools in the nicer neighborhoods are good, but the high schools draw from a diverse population. However, many military kids do great in these environments, it’s what fits your child’s needs and learning style that is important. Check out the schools and see if it’s a good fit for your kids. Private schools such as Ghent Montessori, St. Gregory, Christ the King, Norfolk Christian, Norfolk Academy, and Norfolk Collegiate, are great options for your kids. Virginia Beach is surrounded by water on 2 sides. The Atlantic Ocean provides a typical beachy area with a boardwalk lined with restaurants and bars. The Oceanfront’s boardwalk has been in transition for the past 10 years. Some parts are a bit trashy while other parts, closer to 32nd street have been cleaned up with nice boutique shops and restaurants. This area is very touristy so it can be very crowded and overpriced. Rudee’s Inlet is a fun place to grab a bite to eat on the water and avoid some of the tourists. The North side of Virginia Beach is the Chesapeake Bay. This area is where more locals live and the bay water is perfect for small kids. There aren’t waves or an undertow to worry about. If you are a big surfer, this area is not for you. There isn’t a boardwalk up this way, but instead residential areas with pathways to the beach. Chick’s Beach and the Shore Drive area are very popular with locals. When looking on a map, ‘shore drive area’ is typically Shore Drive between the Lessner Bridge and First Landing State Park, while Chick’s Beach is west of Lessner Bridge off Pleasure House Road. This area is very desirable because it’s close to the water and has lots of restaurants and nightlife. Schools are great here and there is quick access to water, which makes home prices a little bit more pricey around the Chesapeake Bay. A good mix of singles, couples without kids, and families with kids live in this area. Virginia Beach doesn’t have a typical downtown area, however they have cleaned up and remodeled the Pembroke area off Virginia Beach Blvd, called Town Center. Some people refer to this as the downtown of Virginia Beach. Town Center has it all, from big chain restaurants to little boutique shops. This was built about 5 years ago with the intent to clean up the Pembroke Mall area. Since this revitalization, they are remodeling the mall and just added a Target and Old Navy. I really like Town Center because it’s centrally located and architecturally pleasing. It’s not a big area but it’s packed with lots of great shops and restaurants. Another popular area of Virginia Beach is South of NAS Oceana. This area has a mix between old homes built in the 50s and newer construction. Red Wing Park is a great place to throw the football and run around. The areas south of Oceana look like typical suburbia, however there are some nice planned communities, as well. This area is constantly growing. Pungo, a more rural town, touches this area of Virginia Beach. Another area is called the Courthouse Area or Amphitheater Area. This area is off Princess Anne Road and there are a lot of new developments going up in this area. Landstown Commons Shopping Center is close by. Since building this shopping center, this area has built up a lot in the past 3 years. For convenience there is a new Princess Anne Hospital and ER just across the street. If there is a chance your spouse could change bases within Hampton Roads then this is a great area to live. You will be centrally located to everything within a 20 minute radius. The Indian River area of Virginia Beach is a large area with new planned communities and new construction homes. This area has had huge growth over the past couple of years. Some areas don’t have easy access to the highways, however you can get a bigger home for a reasonable price. You may pass some farms in between the growing areas as the newer construction is taking over. The South Holland Road area is centrally located with many amenities nearby such as Landstown Commons Shopping Center and Lynnhaven Mall shopping area. There are many different neighborhoods located off South Holland Road (see map). While this area is centrally located between many different bases, it’s far from highway access, which can cause longer commutes when dealing with stop lights. Kempsville is a more central area, which encompasses a lot of neighborhoods and newer constructed planned communities. It is a great location if your spouse will be going to different bases in the area. It also seems to have more reasonable home prices. Providence Road and Indian River Roads have a lot of strip malls with restaurants and shopping. This area doesn’t have as much character as some of the other areas, but it’s still a nice place to live. The Greenbrier Area of Chesapeake is located just south of the Kempsville area of Virginia Beach and adjacent the Indian River area of Virginia Beach. It is called the Greenbrier area because there is a shopping mall called Greenbrier and many big box stores near the mall. This is a large shopping area with all the amenities you could need. This area is popular for its central location to all bases. This is a nice area, however some of the schools in this area have average ratings compared to other schools in Chesapeake Public Schools. Research each school for a better idea of the quality of schools. Neighborhoods near Greenbrier: Read reviews within a 5 mile radius from Greenbrier. Deep Creek is an area of South Chesapeake located West of 64. This area has larger homes for less expensive prices. Deep Creek prides themselves as having more of a small town feel in the suburbs. Schools here are known to be very good. This is a very desirable area to live, however it’s further from the bases so you trade more square footage for a longer commute. Neighborhoods Near Deep Creek: Bryant Farms, Cedar Creek, Cedar Point Meadows, Creekwood, Deercrossing, Kings Gate, Deercrossing, Kings Gate, Mariners Pointe, Marsh Creek, Mill Creek Harbor, Mill Creek Harbor, Miller’s Run, New Mill Lanindg, Olde Mill Run. Sawyer’s Mill, Ships Crossing, The Landings, The Meadows. Read reviews about neighborhoods within a 5 mile radius of Deep Creek. Great Bridge is another area of South Chesapeake located East of 64. This area has larger homes for less expensive prices. This area has a suburban feel with a tight knit community. Many families don’t leave Great Bridge area, except for the commute to base. This area has many amenities so you don’t need to drive far to find a grocery store etc. This area is known for excellent state of the art schools within the Chesapeake Public School System. Neighborhoods Near Great Bridge: Berkshire Estates, Cahoon Plantation/Las Gaviotas, Cheshire Forest, Etheridge Pines/Woods, Ravenna, Stonegate. Read reviews about neighborhoods within 5 mile radius of Great Bridge. Neighborhoods Near Western Branch zip 23321: Braddock Landing, Davds Mill, Dock Landing, Dock Landing Pointe, Goose Creek Estates, Jolliff Woods, Miars Plantation, Olde Woodeland estates, Tyre Neck, The Crossing. Read reviews of neighborhoods within a 5 mile radius of Western Branch. Portsmouth is a very diverse city with many different parts. The Downtown/Old Town area is cute and historic. It features many museums, such as the Children’s Museum and Sports Museum. Portsmouth Naval Hospital is located near downtown and there are some streets with cute homes and upcoming neighborhoods. Usually families who live near downtown Portsmouth don’t have kids due to the poor schools in the area. Other parts of Portsmouth are run down or have an industrial feel. Read reviews about neighborhoods within a 5 mile radius of Downtown Portsmouth. A nicer part of Portsmouth is the Churchland area, which touches the Western Branch part of Chesapeake. This area has the better schools in the Portsmouth Public Schools System. North Suffolk is located near Western Branch area of Chesapeake. This area is a very nice part of Suffolk. Harbour View is a very nice planned community with newer construction homes. Homes in Harbour View are expensive and large. In addition to some planned neighborhoods, you also have older unplanned neighborhoods with homes sitting on large lots. Schools are good in this area for the Suffolk Public School System. 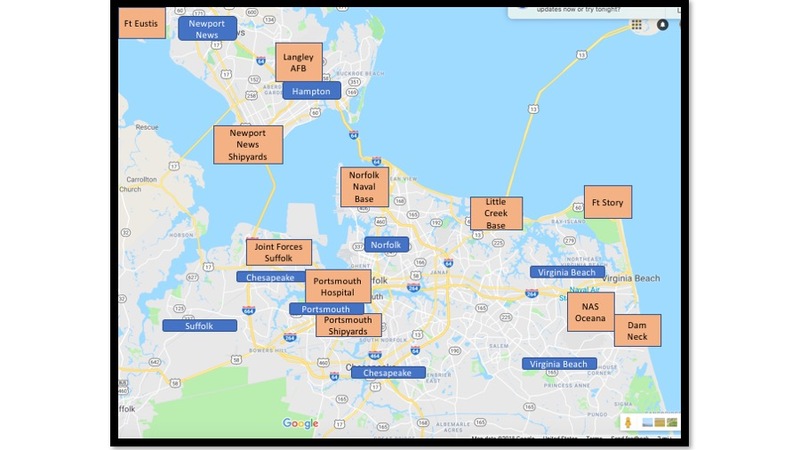 Neighborhoods Near North Suffolk: Harbour View Riverview, Kempton Park, Steeplechase, Burbage Grant, Bayberry Cove, Bennetts Creek, Cedar Point, City of Driver, Governors Point, Suffolk Meadows. Read reviews about neighborhoods within a 5 mile radius of North Suffolk. Carrolton is located North of Northern Suffolk and West of Newport News/Hampton with easy access across the James River Bridge. This area is very suburban, but growing due to it’s convenient location to Hampton and Newport News without having to take a tunnel. Neighborhoods Near Carrolton: Read reviews about neighborhoods within a 5 mile radius of Carrollton. Every school has its pros and cons and students, especially military kids, thrive in different environments. The key is to find an environment that fits your child’s needs, but how do you do this when you are stationed miles away and you have to research online? 1. Read National Rankings from 2014 High School Challenge to have a broad perspective. 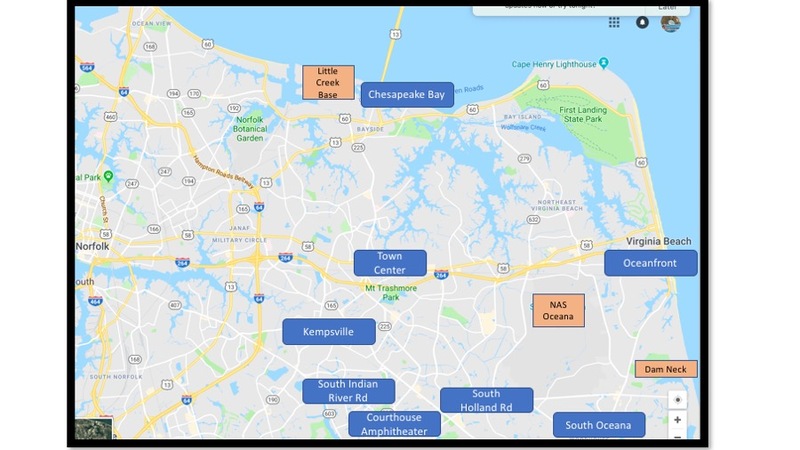 If you are stationed at NAS Oceana, I think you should consider sending your child to a Virginia Beach school rather than living further away in Chesapeake or Norfolk. If you are stationed at Norfolk Naval Base, you have much more options due to its more central location. Many military kids whose parents are stationed at Norfolk Naval Station go to Chesapeake, Norfolk, North Suffolk, or Virginia Beach Schools. 5. School Ratings may not accurately reflect this area. Many schools have ‘academies’ within their HS walls, which affects test scores. Be mindful when looking at school ratings in the area. I strongly feel the ratings are not accurate for the area, especially for the Virginia Beach Schools. For example, Chesapeake has higher ratings on GreatSchools.org, but Virginia Beach Schools are ranked higher on national school lists. Read my opinions on schools in the area and how academies may affect ratings. Find recommended local businesses in Norfolk / Virginia Beach and find a directory of fun things to do in Hampton Roads. Whether you are looking to buy or rent a home, search our large database of Military Friendly Realtors near NAS Norfolk. Real estate agents can help you narrow down your search and keep you in the loop when houses come on and off the market. Search MilitaryByOwner's military homes for sale or rent near NAS Norfolk.